Progress in Anti-Bribery Enforcement – Risk on Door Step? Across the globe, there is remarkable progress in enforcement environment against corruption. In 2015, there were many anti-corruption actions in United States and many other countries. This worldwide boom of anti-corruption efforts puts pressure on multinational companies doing business in potentially high risk environment. Companies now need to take specific measures to mitigate the increased risk associated with business, transparently. The US Department of Justice and the U.S Securities and Exchange Commission are no longer the only two organizations working towards anti-bribery enforcement. Many countries are battling corruption and intergovernmental cooperation against bribery is on rise. Parallel enforcement actions involving multiple jurisdictions is another challenge for businesses operating in many nations. Why and how it started……. The United States Jurisdiction was the first to criminalize the bribery of foreign officials under the Foreign Corrupt Practices Act (FCPA), 1977. This legislation was regarded for its fair enterprise but lacked global equivalency. The other countries started criminalizing foreign bribery only in late 1990s. Later a series of international treaties addressing bribery came into existence, i.e.Organization for Economic Co-operation and Development’s (OECD) Convention on Combating Bribery of Foreign Public Officials in International Business Transactions and the United Nations Convention against Corruption (UNCAC). Though there was rise in legislation against bribery, enforcement was did not keep pace. According to data released by the OECD in 2014, more than half of the signatories to the OECD’s anti-bribery convention had failed to impose any sanctions for cross-border corruption.(Source:http://www.corporateknights.com/channels/leadership/corruption-interruption-14522328/). However there is a start to stringent enforcement, according to TRACE’s 2014 Global Enforcement Report, there were 211 investigations involving foreign bribery being conducted in 27 countries by the end of that year. While the U.S. leads the world in total enforcement actions overall, in 2014 more enforcement actions were brought outside than within the United States. (Source: http://www.corporateknights.com/channels/leadership/corruption-interruption-14522328/). Internal security is the main reason towards the surge in anti-bribery enforcement along with recent decision by a number of countries to arm themselves with the powers to seek out bribery beyond their borders. There has also been increased international cooperation among enforcement agencies. For example, earlier this year 21 Asia-Pacific Economic Cooperation (APEC) member countries agreed to begin sharing sensitive case information among themselves. The U.S. Department of Justice has stated that almost all FCPA investigations involve an important element of information sharing. The agency has recently worked with authorities in countries as varied as Colombia, Indonesia, Latvia and Saudi Arabia. (Source:http://www.corporateknights.com/channels/leadership/corruption-interruption-14522328/). In January 2014, India’s President signed the Lokpal and Lokayuktas Act, 2013, a landmark law aimed at combating corruption by creating an anti-graft “Lokpal” (i.e., ombudsman) with broad powers to prosecute politicians, ministers, and senior civil servants, including the country’s Prime Minister. In March 2014, the Public Works and Government Services Canada (“PWGSC”), the main contracting arm of the Canadian federal government, implemented measures to strengthen its “Integrity Framework,” which has the stated goal of supporting accountability and integrity in federal government contracts and real property transactions. In February 2014, the European Commission published the first E.U. Anti-Corruption Report, highlighting the enhanced visibility of anti-corruption issues on the political agendas of E.U. Member States in the wake of the financial crisis. (Source: https://www.cov.com/files/Publication/446fa508-b853-4f88-a902-615eb62a28aa/Presentation/PublicationAttachment/1c4f86eb-6ce7-4115-aed6-67bd2d1e5ee6/Trends_and_Developments_in_Anti-Corruption_Enforcement_Winter_2015.pdf). In 2013, Brazil passed the Clean Companies Act, which gives Brazilian authorities jurisdiction over any company with a branch, registered office or other representation in Brazil. While Australia is considering expanding the reach for its foreign bribery offences, authorities are investigating a surge of foreign bribery allegations within the country. And, as of last year, the U.K. Serious Fraud Office was pursuing cases against 37 defendants. (Source:http://www.corporateknights.com/channels/leadership/corruption-interruption-14522328/). Companies are now more than willing to disclose their wrong doing to government authorities if any along with the anti-bribery enforcement machinery being adopted by them in their annual and sustainability reports as a part of Business ethics and transparency. There has been an increase in whistleblower policy not just in US and other countries there is a considerable increase of Whistle blowing in public and private spaces, in China and India as well. The SEC has stated that 30 per cent of its foreign bribery investigations began after being contacted by a whistleblower. In China, this figure is as high as 80%.According to Deloitte’s 2015 Compliance Trends Survey, more than half of African companies surveyed had increased their compliance budgets over the past year.Ernst & Young’s APAC Fraud Survey 2015 found that only 20 per cent of employees of large companies in 14 Asia-Pacific countries stated that they were willing to work for a company involved in bribery or corruption.(Source:http://www.corporateknights.com/channels/leadership/corruption-interruption-14522328/). The future looks positive in terms of anti-bribery enforcement for countries and corporations as more and more legislation and compliance standards are beginning to rise. Data kept pouring in and 2014 witnessed many climate events that reaffirmed that change in climate is real and is happening faster than anticipated. But the possibility of arriving at an effective climate deal at Paris 2015 seems more difficult at the close of 2014 than it was at the beginning. At the economic head winds turned southward in 2007, some envisioned efforts to mitigate climate change and address other environmental and social challenges in the challenging scenario could be a way of building resilience. Whether the bottoming out has occurred or not is still being debated, integrating sustainability and sustainable development in solution has definitely been given a miss, though some forums did mention sustainability in the solution. Imperatives to address the challenge of sustainable development are still seen to retard economic growth. Growing consumers in emerging countries like China and India, and evolution of not so desirable consumption patterns, is another challenge for sustainability. Efforts by some businesses in product stewardship and closing the material loop, is welcome in the direction, but new middle classes are behaving in counter purpose to these efforts. Repeated instances of gender related offenses have come to light across the globe. Assertive civil society pointed out lack of gender equality in the work force. Business began to address work place sexual harassment and other issues related to gender inequality and, in general, improving diversity. With increased spread of internet and activism, need for transparency has increased. It is either you “disclose” now or it will be “open” to all tomorrow. Though it is realized and need for transparency is mentioned more often, businesses, and in general many institutions, are hesitant to be transparent. Stakeholder engagement, like sustainable development does get mentioned and written often, but business continues to consider it as “not practical”, “hindrance”, “raises expectations” etc. Even those, who engage do not make right efforts and follow creative processes and hence receive little participation or engagement. Social media and its spread has increased visibility of value chain of products and services. Increasing focus on managing supply chain risks was seen in 2014, as more and more supply chain violations came to light. However, responsible supply chain management is limited to compliance with “regulations” and in some cases disclosure standards”. Only in very limited cases, it has grown to collaboration or co creation. There has been a commendable improvement in the number of sustainability reports published; howsoever the reporting activity has been majorly a green washing measure and not integration of sustainability paradigm in strategy and operations. The scope of the activities needs to improve not just in words but also in actions. Materiality Assessment: What is it? The concept of materiality has its origins in the auditing and accounting processes of financial reporting. In financial terms, a concept is considered material to the company if its omission or misstatement influences the economic decision of users. In recent years, the concept of materiality has been adopted in sustainability and is increasingly influencing the design of sustainable strategies and reports. In contrast to financial statements, sustainability covers a multitude of issues- environmental, social, economic and more. This context requires a more comprehensive definition for materiality. Materiality Assessment, in the context of sustainability, is performed to assess what sustainability issues and concerns are most important to the company and its stakeholders. During the assessment implicit and explicit stakeholder perspectives on a set of sustainability issues that are relevant to a business, are mapped through variety of means. This information and perspectives are used to inform business decision making and communications strategies. Results are generally presented on a Materiality Matrix that plots stakeholder priorities vs. the priorities of the management team. Materiality assessments help business leaders understand the priorities their stakeholders place on various sustainability issues relative to the importance management has placed on. This assessment of alignment between stakeholder concerns and company efforts can reduce risk and enhance engagement. Materiality analysis is also seen as step, that can integrate sustainability and financial disclosures by the business entities. How to conduct Materiality Assessment? Step 1: Identify and priorities your major stakeholders – investors, employees, consumers, suppliers, NGOs, government and the media. Organize major stakeholders into segments and identify the aspects of sustainability that could relate to these segments. Step 2: Identify and prioritize major sustainability indicators (economic, environmental, labor practices, human rights, society, product responsibility) using GRI Guidelines / SASB maps for sectors etc., and decide on the most important sustainability indicators relating to your organization, with reference to major stakeholders groups and segments. The number of indicators will depend on the scope of activities of your organization and available resources. To determine the importance of indicators, one can conduct surveys, media research, and analyze internal documents. Step 4: Rank the indicators on a matrix using two axis, one for importance, and one for impact. Why is it important to disclose the outcomes of materiality assessments? As mentioned earlier, the term materiality comes from the financial world. Guidelines for Sustainability disclosures such as GRI, SASB etc., also incorporate the concept of materiality into their reporting guidelines with the aim of elevating sustainability issues to the same level as other traditional business issues and consider the financial risks and opportunities associated with those issues. It is keeping with the growing importance investors are placing on effective management of sustainability within companies. In 2013, 40% of all shareholder resolutions were related to sustainability and climate change and 94 US companies were targeted. These resolutions actually forced companies including Nike and Starbucks to change their policies and programs. In addition, by disclosing how they arrived at material issues in the sustainability report, company is demonstrating to all its stakeholder it intent to be transparent, their attempt to provide information and address concerns of the stakeholders and explaining why certain issues are not being addresses or disclosed. Is Materiality Assessment undertaken one time- first time…or is it periodic exercise? 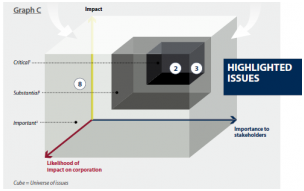 Materiality assessment is useful tool that can help companies identify stakeholder concerns and potentially avoid stakeholder/shareholder complaints and actions. GRI encourages companies to reach out to external stakeholders for input when conducting a materiality assessment. For companies further along in their sustainability journey, assessing materiality on an ongoing basis helps validate your existing strategies. It could be an integral part of companies strategy formulation and be done as frequently as Board revisits strategy. How should companies determine which external stakeholders to engage in a materiality assessment? You need to think about which stakeholders are impacted by your business, or have influence on your business. These can include customers, different levels of government, NGOs, investors, employees, local communities and suppliers. Shareholders are especially important if you are a publically traded company. You may have customers sending you sustainability questionnaires as part of their own supplier assessments – they would be important stakeholders to involve – as would a long time strategic NGO partner or a particularly vocal NGO that has been contacting you about a certain sustainability issue. GRI has prepared helpful guidance on how to map out your stakeholders and prioritize them – pages 11-12 have the specific guidance on assessing materiality. The stakeholders you choose to engage can depend on where you are in the value chain, who has shown interest in your sustainability efforts and who you want to involve in your sustainability efforts moving forward. Think about those stakeholders who would have some insight into the business risks or opportunities you face from greater levels of action, or inaction. Recently, we were engaged with a company, involved at a stage of value chain, where it has least control on stakeholders that are supplying main raw materials and similarly lesser control on customers in the way that they use their products. Many sustainability risks are at the end of suppliers and customers. So engaging with them and understanding sustainability risks at their end revealed a few more material sustainability issues in addition to those identified by company’s management. Once you have mapped out your key stakeholders and selected the ones you want to include, you then survey people from those stakeholder groups. You can send them electronic surveys, interview them one-on-one or even invite them to participate in a focus group. This external view can add a lot of value to your business. What do the outputs of a materiality assessment look like? At the top right hand corner of the matrix “energy efficiency and energy management” were identified as being the most important elements to both their stakeholders and their business. Autodesk will be sure to report on the activities and programs they have in place to manage their energy consumption in their sustainability report. This also means that Autodesk needs to actively manage this issue internally, by setting goals for improvement, and reviewing progress against those goals on a regular basis. 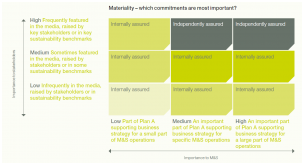 What benefits the companies are seeing by doing a materiality assessment? A company in the mining sector, new to sustainability practice, said it really helped them to prioritize the issues for sustainability endeavor (and not to take on too much initially). The exercise also helped this client to build internal alignment as many senior leaders were engaged in ranking what mattered most. In addition to the benefit of alignment, it brought people from different business functions across the company together – people beyond the sustainability team – including folks from marketing, finance, risk management, R&D, etc. For a client in the Auto sector, who already had a sustainability processes, but wanted to strengthen it, the materiality exercise helped to validate elements of their existing approach while revealing several areas for improvement. Our experience with some clients also proved that materiality analysis is a great way to engage external stakeholders on a regular basis for early identification of issues and to incorporate their input into your strategy. It makes it easier to respond to their questions about issues they think you need to address. In order to fulfill the GRI G4 Guidelines or to respond to Sustainability Accounting Standards Board (SASB) in the US, companies need to document the process to assess materiality and the outcomes of that assessment. Solar Industry’s expectation from the budget… Will the sun shine? The Railway budget cleared the intention of the government on treading greener tracks towards achievement of its agenda. This includes announcement of the plan to harness solar energy by utilizing roof top spaces of railway stations, other railway buildings and land, including through the PPP mode. It is estimated that the railway will be sourcing 20% (500MW) of its total requirement (4000 MW) majorly from rooftop solar applications in the next 2-3 years. What is the solar industry expecting from the budget tomorrow? We have tried to compile a list below. MNRE fund allocation: While the previous government had reduced the allocation to MNRE in its interim budget, the new government is expected to reverse the decision. There are huge backlogs in pending disbursement of subsidies and GBI which needs to be cleared and streamlined for future growth. Also the government is expected to expand upon the previous government’s announcement of four ultra-mega solar power projects (each with over 500MW capacity). Anti-dumping duty conundrum: The MNRE has shown its reservations for imposing anti-dumping duty on solar gears taking note of the lack of capacity to support expected installations. The commerce ministry on other hand is in favor of the duty to support domestic manufacturing industry. While the manufacturers have informed about having sufficient manufacturing capacity of both solar cells and panels, the market doubts competitiveness of domestic manufacturers even in case the duty is imposed. The government needs to handle the situation in a way that neither the capacity growth of solar hampers due to cost increase (on account of anti-dumping duty), nor does the huge domestic manufacturing capacity remain idle due to low cost imported gears. Special status: There are demands to classify Solar PV manufacturing industry as ‘Infrastructure industry’ and make it a priority lending sector while treating it differently as compared to the conventional power sector. One of the major challenges the sector is facing is with respect to project financing. The government needs to bring in effective incentive tools to support RE capacity addition. A recent report by CPI & ISB had compared interest subsidies v/s GBI or VGF and concluded that interest subsidies would actually reduce support requirement from government. Purchase obligation: The REC market has crashed with volume clearance falling below 5% even at floor price. The market is expecting stronger and immediate measures to enforce the renewable purchase obligation on the Discoms and large captive & open access consumers. There is a need for – Timely reviews, a “no-waiver” approach & stronger penalties from the SERCs to save the REC market and boost the renewable energy sector which has been missing its installation capacity targets year-on-year basis. Encouraging rooftop: In order to achieve the PM’s goal to bring solar energy to each household, there is a demand for personal Income Tax benefits for installing solar applications on house rooftops. The current level of subsidy (30%) has not made the shifting to solar applications for household attractive enough. Further a net-metering framework on national scale is expected to be simplified and operationalised for rooftop solar to inject surplus power to grid. The model recently announce by Haryana to make solar energy mandatory on some categories of buildings and areas with a suitable enforcement mechanism also needs to be duplicated across the board. Tax waivers: There is a demand from project developers and EPC players to waive-off taxes, including CST, VAT and service tax, on solar power and heating application projects for a period of at least 5 years when grid parity is expected to be achieved. Accelerated Depreciation (AD) reinstatement: The government is expected to announce reinstatement of AD benefit to wind power developer, the withdrawal of which in April 2012 has been attributed as one of the main reasons for drop in wind power project installation. AD benefit to wind projects will also put pressure on new capacity addition of solar power projects from the same target group of developers seeking tax benefit. Transmission capacity scale up: Last year saw huge quantum of wind power getting lost in Tamil Nadu due to grid constraints. A focus strategy on building dedicated green transmission corridors is required for deployment of renewable power on a larger scale. The southern grid is still yet to be fully integrated with the rest of India causing huge constraints on power flow across the two sides. Stronger transmission shall help grow inter-state sale of renewable power. Clearer and consistent policies: Power being concurrent issue there are lot of inconsistencies between the central and state policy framework. There is a need for clearer and consistent policy from start to end including grid connectivity, subsidy, open access implementation, RPO/ REC regulations, etc. CSR cannot be limited to neighboring community development without any link to business. The Companies (Corporate Social Responsibility Policy)Rules 2014, issued on 27th February , 2014 and applicable beginning 01st April 2014, continued to perceive CSR, despite serious objections by many in Industry, as something that is do not further business interest. It is welcome that the final notification deleted words like “CSR Actions cannot be benefitting business”, and had only limited exclusions like, “activities undertaken in pursuance of normal course of business” “ CSR projects cannot benefit only the employees”. However, limiting CSR to “community actions” that have little linkage to business is not in line with the prevalent understanding of this word….or as it is defined or perceived in Rio +20 . In sharp contrast, Department of Public Enterprises also mandates the CPSUs to spend certain percentage of their profits on sustainable development/CSR , but here definition of sustainable development/CSR clearly and explicitly includes actions that benefit the business directly and indirectly and in long and short terms. We acknowledge the importance of corporate sustainability reporting and encourage companies, where appropriate, especially publicly listed and large companies, to consider integrating sustainability information into their reporting cycle. We encourage industry, interested governments as well as relevant stakeholders with the support of the UN system, as appropriate, to develop models for best practice and facilitate action for the integration of sustainability reporting, taking into account the experiences of already existing frameworks, and paying particular attention to the needs of developing countries, including for capacity building (p 47, The Future We Want). Globally, there is an increasing demand from the investors (about 80 large global financial institutions representing about 70% of global capital flows adopted equator principles) and other stakeholders, that the businesses have to generate and deliver value to all stakeholders. It is believed, that a business that delivers value to all stakeholders and measures such value in economic, social and environmental terms is in fact acting in self interest and building long term shareholder value. Voluntary Guidelines on Social, Environmental and Economic Responsibilities of the Business. It has urged all the businesses in India, to practice these nine principles of responsible business and SEBI went ahead and amended listing agreement and included a requirement that top 100 listed companies on an exghange have to disclose their policy and performance on the nine principles of National Voluntary Guidelines on Social, Environmental and Economic Responsibilities of the Business. So, what is to be corrected in the Companies (Corporate Social Responsibility Policy)Rules 2014? The Companies (Corporate Social Responsibility Policy) Rules 2014 make it mandatory to have board focus on CSR, develop and deploy CSR policy and disclose. It specifies that company spend 2% of average of its last three preceding year’s profits and in case it does not, it has to provide reasons in the disclosure. This prescription that company through its board have to have focus on CSR and govern the processes to deliver social value would have been appreciated by the business if the CSR was defined to deliver long term shareholder value, contributes to the welfare/benefit of the stakeholders(like customers, suppliers, communities etc) and improves the access to capital. Many industry leaders believe that managements and boards struggle to generate and balance the short term interest of shareholders and long term benefit of the company and the shareholders cannot receive adequate attention and such an attention may be effectively achieved by regulation as in the Companies (Corporate Social Responsibility Policy)Rules 2014. Business has serious objection to the way CSR is defined , excluding activities/projects/programs that have a business benefit . As in recent (April 2013), Department of Public Enterprises guidelines on CSR /Sustainability for Central Public Sector Enterprises, allow CSR expenditure on furtherance of sustainable development inside business operations in addition to activities listed in schedule iiv. Implementation of suggestion 1, is an action on p47 of Rio +20 and only about 10 countries have acted on the same till date. This will give India , a leadership position and will ,at the least, improves the access to capital. Suggestion 2, would expand the definition of CSR in the rules, and makes it more acceptable to business.